Orange-yellow Sponges, white Sea Frost, Red Encrusting Sponge, and Feather Hydroids on a branch of a gorgonian. * The above image was taken some distance into one of the two-ended Y-Caves at Jackson Bay, Little Cayman Island. The depth was perhaps 110 feet or 34 meters. It contains roughly the same marine organisms as the parent image, except for the absence of green algae. The orange-yellow sponge is probably (Ulosa hispidus), and there are traces Red Encrusting Sponge. 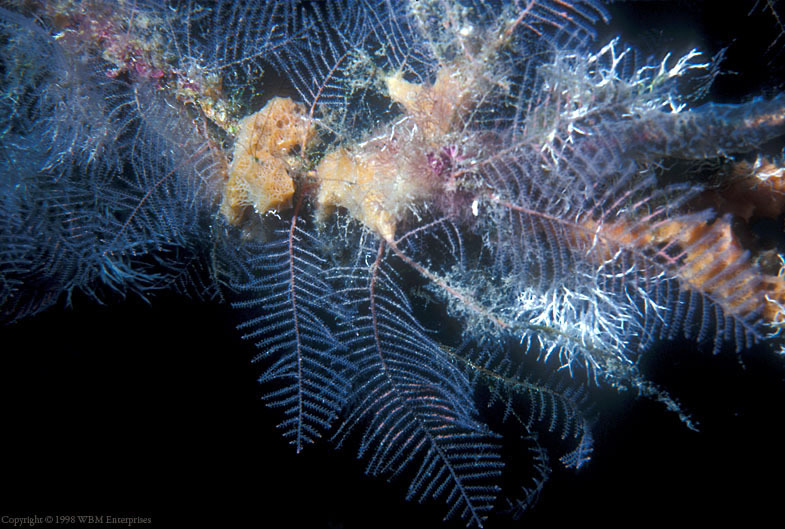 The feather-like Hydroids are (Sertularella speciosa), and the white Sea Frost is a Colonial Serpulid Worm (Filograna implexa). The Stem serving as a base is from a gorgonian, or perhaps a species of Black Coral (Antipathes. sp). There is an obvious similarity between the above image and the previous one. It has been observed that for two-ended, open sea caves of sufficient length, depth of penetration into the cave is related to an equivalent underwater depth. The above image was taken deep in the cave, at a depth of between 100 and 125 feet (30 and 38 meters), and; together with the previous image taken at 185 feet or 55 meters, serves to illustrate the point. There is a clear resemblance.